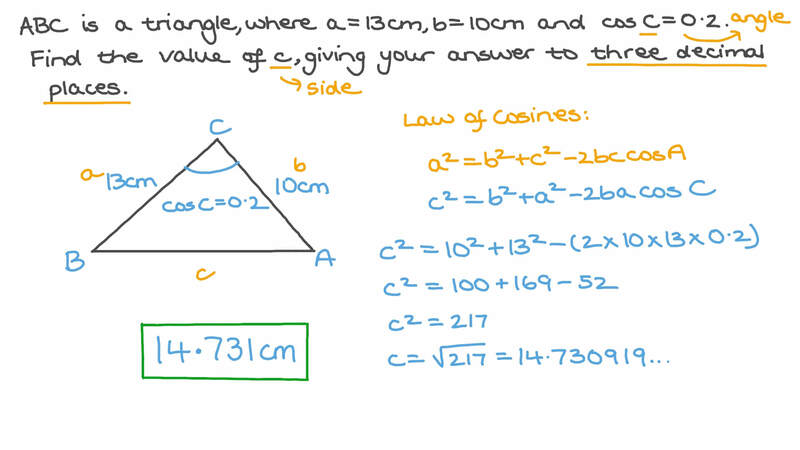 In this lesson, we will learn how to find the sides and angles in non-right triangles using the law of cosines. 𝐸 and 𝐴 are two hot air balloons flying at heights 117 m and 84 m respectively. The angles of depression at a point 𝐶 on the ground from 𝐸 and 𝐴 are 4 0 ∘ and 2 9 ∘ respectively. Find the distance between to the balloons giving the answer to the nearest metre. In the given figure, using the law of cosines, find 𝜃 . Give your answer to two decimal places. In the given figure, find 𝜃 . Give your answer to two decimal places. 𝐴 , 𝐵 , and 𝐶 are three cities. Find the distance between cities 𝐴 and 𝐵 , giving your answer to the nearest kilometre. A plane travels 800 meters along the runway before taking off at an angle of 1 0 ∘ . It travels a further 1 0 0 0 meters at this angle as seen in the figure. Work out the distance of the plane from its starting point. Give your answer to 2 decimal places. 𝐴 𝐵 𝐶 is a triangle, where 𝑎 = 1 3 c m , 𝑏 = 1 0 c m , and c o s 𝐶 = 0 . 2 . Find the value of 𝑐 , giving your answer to three decimal places. A biker travelled from city 𝐴 to city 𝐵 via city 𝐶 with a uniform speed of 52 km/h. He then returned directly to city 𝐴 with a uniform speed of 89 km/h. Find, in minutes, the total time of his whole journey to two decimal places. 𝐴 𝐵 𝐶 is a triangle, where 𝐵 𝐶 = 2 5 c m , 𝐴 𝐶 = 1 3 c m , and 𝑚 ∠ 𝐶 = 1 4 2 ∘ . Find the length 𝐴 𝐵 giving the answer to three decimal places. 𝐴 𝐵 𝐶 is a triangle where 𝐵 𝐶 = 3 8 c m , 𝑚 ∠ 𝐴 𝐶 𝐵 = 6 0 ∘ and the area is 3 9 9 √ 3 cm2. Find the other lengths and angles giving lengths to one decimal place and angles to the nearest degree. The side lengths of a triangle are , , and . Sarah calculated, to one decimal place, the sizes of the corresponding angles as , , and . Was she correct? 𝐴 𝐵 𝐶 is a triangle, where 𝑎 = 2 7 c m , 𝑏 = 1 5 c m , 𝑐 = 2 1 c m , and 𝐷 ∈ 𝐵 𝐶 , where 𝐵 𝐷 = 1 6 c m . Find the length of 𝐴 𝐷 , giving the answer to two decimal places. 𝐴 𝐵 𝐶 is a triangle where 𝑎 = 1 8 cm , 𝑏 = 1 0 cm and 𝑚 ∠ 𝐶 = 7 6 ∘ . Find the measure of ∠ 𝐴 giving the answer to the nearest second. 𝐴 𝐵 𝐶 is a triangle where 𝑎 = 6 7 c m , 𝑏 = 4 9 c m and the perimeter is 148 cm. Find the largest angle in 𝐴 𝐵 𝐶 giving the answer to the nearest second. 𝐴 𝐵 𝐶 is a triangle where 𝑎 = 2 5 cm, 𝑏 = 2 0 cm and 𝑐 = 2 9 cm. Find 𝑚 ∠ 𝐴 giving the answer to the nearest second. 𝐴 𝐵 𝐶 is a triangle where 1 1 5 𝐴 = 1 5 𝐵 = 1 1 8 𝐶 s i n s i n s i n . Find 𝑚 ∠ 𝐶 giving the answer to the nearest second. Find the value of 𝑎 to 2 decimal places given that the measure of Angle 𝐴 is 6 4 ∘ , 𝑐 is 10 cm, and 𝑏 is 16 cm. For the triangle given, find the value of the three angles to the nearest degree. Find 𝑚 ∠ 𝐴 to one decimal place. Complete the expression for triangle 𝐴 𝐵 𝐶 : 𝑎 + 𝑏 − 𝑐 ⋯ = 𝐶 2 2 2 c o s .
𝐴 𝐵 𝐶 is a triangle where 𝑃 − 𝑎 = 2 2 c m , 𝑃 − 𝑏 = 3 2 c m , 𝑃 − 𝑐 = 8 c m and 2 𝑃 = 𝑎 + 𝑏 + 𝑐 . 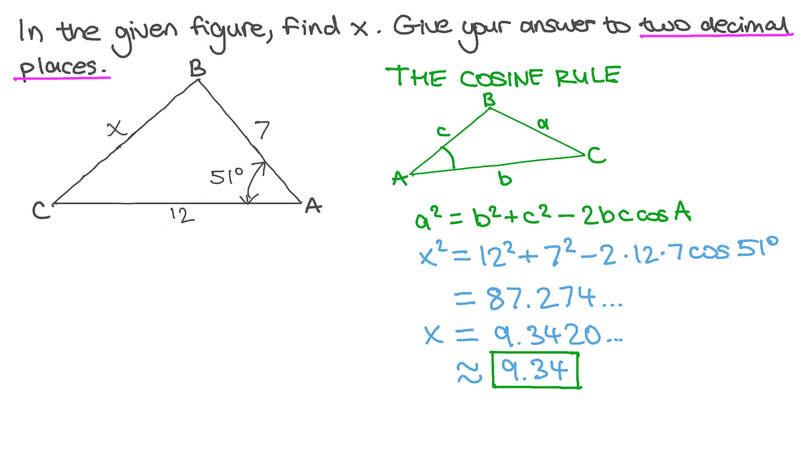 Find the largest angle in the triangle giving the answer to the nearest second. 𝑋 𝑌 𝑍 is a triangle where the ratio between s i n 𝑋 , s i n 𝑌 and s i n 𝑍 is 2 3 ∶ 1 9 ∶ 1 6 . Find the smallest angle in 𝑋 𝑌 𝑍 giving the answer to the nearest second. 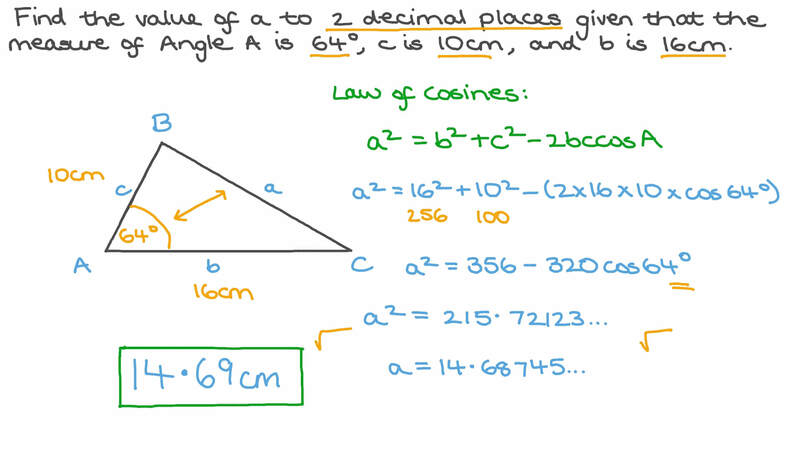 Which rule could be used to find the length of an unknown side of a triangle, given the other two lengths and the measure of their included angle. 𝐴 𝐵 𝐶 is a triangle where 𝑃 − 𝑎 = 2 0 c m , 𝑃 + 𝑎 = 1 1 6 c m , 𝑏 = 4 1 c m and the perimeter is 2 𝑃 . Find the measure of the smallest angle in 𝐴 𝐵 𝐶 giving the answer to the nearest second.